Yohan Blake is a former 100m world champion. Yohan Blake is coming to Dublin. THE SECOND FASTEST man on the planet will race in Dublin this Friday evening, the organisers of the Morton Games in Santry have confirmed. 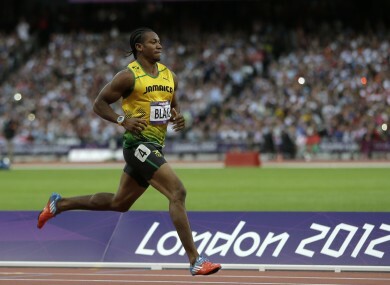 Yohan Blake will run in the AON Men’s International 100m race just after 7.30pm at the Dublin venue. The Jamaican ran a personal best of 9.69 in Lausanne, Switzerland in 2012, the same year he finished second to team-mate Usain Bolt in both the 100m and 200m at the Olympic Games. Blake also won the 100m at the 2011 World Championships and his race will run at 7.36pm on Friday. The pre-programme for the Morton Games meet will start at 5.30pm with the international programme getting under way at 7pm. Tickets — €10.00 for adults with accompanied children free — are available from Clonliffe Harriers clubhouse on Tuesday, Wednesday and Thursday this week from 7pm to 9pm. Email “The second fastest man on the planet is racing in Dublin this Friday”. Feedback on “The second fastest man on the planet is racing in Dublin this Friday”.